The American-Arab Anti-Discrimination Committee (ADC) cordially invites you to this year’s production of our annual Turaath festival celebrating Arab-American heritage and culture. We are excited to announce that New York Arab-American Comedy Festival comedians, The Dean Obeidallah Show and Maysoon Zayid along with comedians Maher Matta and Atheer Yacoub will be hosting a fun-filled night of stand-up comedy. Come join us for a night of fun and laughs! 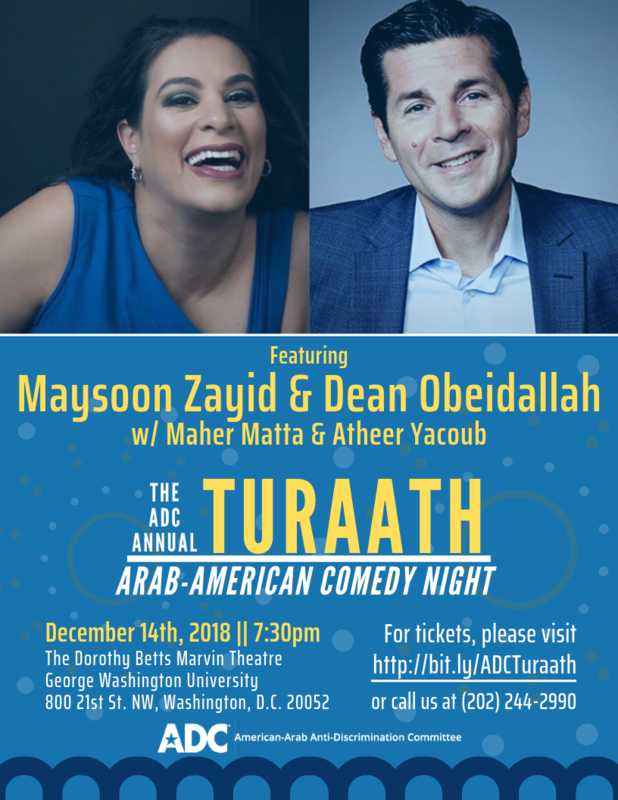 Turaath will be held on Friday, December 14th, 2018 at 7:30 PM at the Dorothy Betts Marvin Theatre in the Marvin Center at George Washington University. Don’t miss out! Purchase your tickets HERE today!